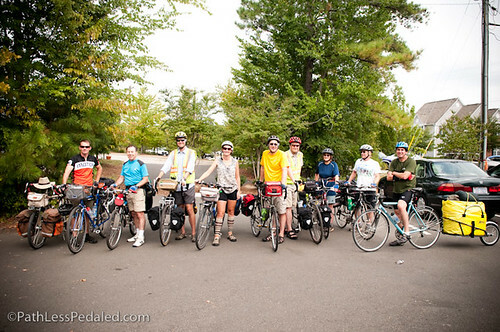 Our S24O in Durham was a great success. Jack, our host and a local bike advocate did an amazing job of picking a route and coordinating the logistics. We had a real varied mix of people who joined us, which made the trip even better. There were a few experienced tourers but also some people who have never gone bike camping before. Here is a video and some snaps of the trip. 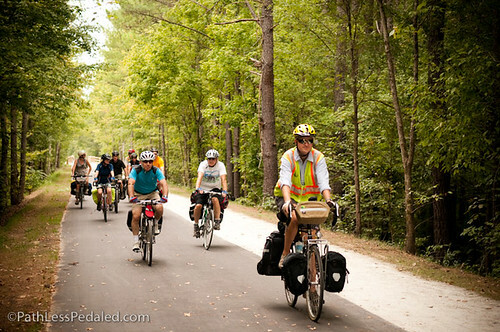 We rode about 20 miles from South Durham to Jordan Lake, where we camped for the night. The ride to the lake was cool and overcast, a nice change from the heat. 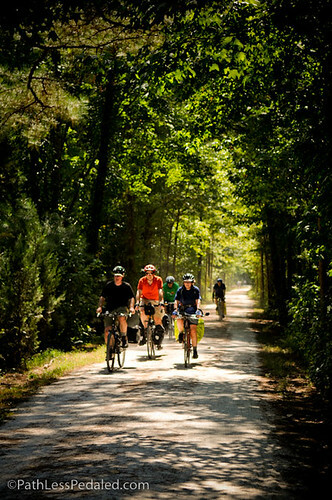 We rode the American Tobacco Trail which is just stunning and shaded with trees. We turned more than a few heads on the streets of Durham and on the trail. It was great fun to have our own bike parade and to perhaps expose people to a type of cycling they aren’t usually use to. The trip was also a great way to hang out with some readers who have been following our trip for a while. We hope to do more of these as travel. As funny as it sounds, its great to be able to do a short bike camping over-nighter, even in the middle of our open-ended trip. Random question – what kind of camera and video camera do you use? Great footage and shots! The ATT bridge over Interstate 40 is scheduled to open early October 2013. *The 270-foot-long pedestrian bridge is on schedule for completion in late September or early October 2013. The bridge is located just west of Fayetteville Road and the connection to the trail heading south will be located in the parking lot near Southpoint Cinemas at the Streets at Southpoint. * This $11 million project also constructed approximately 4.2 miles of new trail and includes the new bridge over Interstate 40, extending the American Tobacco Trail from its current end point on N.C. Highway 54 at Fayetteville Road to the Chatham County line.